I’ve always had an interest in stained glass and many years ago I used to create stained glass sun-catchers, panels and terrariums which I sold on craft markets and in local garden centres. 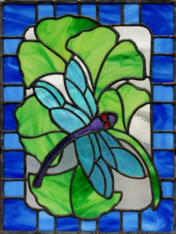 In 2010 to 2011I studied the art of stained glass at the Creative Glass Guild in Bristol where I learned new techniques including glass fusing, slumping, casting, etching and sandblasting. I now create a whole variety of stained glass objects which I sell at craft markets and specialist glass shops. I also take commissions, the images below are examples of recent commissions. I’ve always had an interest in stained glass and many years ago I used to create stained glass sun- catchers, panels and terrariums which I sold on craft markets and in local garden centres. In 2010 to 2011I studied the art of stained glass at the Creative Glass Guild in Bristol where I learned new techniques including glass fusing, slumping, casting, etching and sandblasting. I now create a whole variety of stained glass objects which I sell at craft markets and specialist glass shops. I also take commissions, the images below are examples of recent commissions.